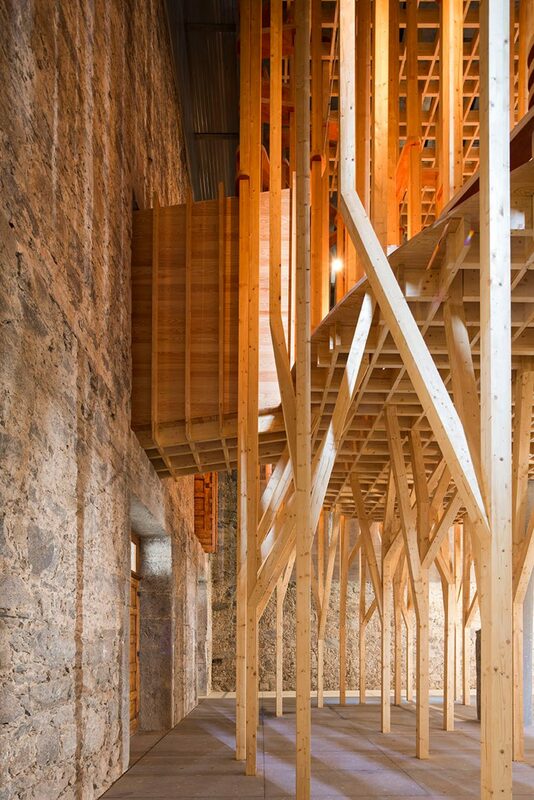 This raised wooden structure, designed by Cerejeira Fontes Architects, creates a secluded inner chapel inside an old church in Braga, Portugal. Braga-based Cerejeira Fontes was tasked with renovating the Imaculada Chapel, a decaying church building built during the second world war. 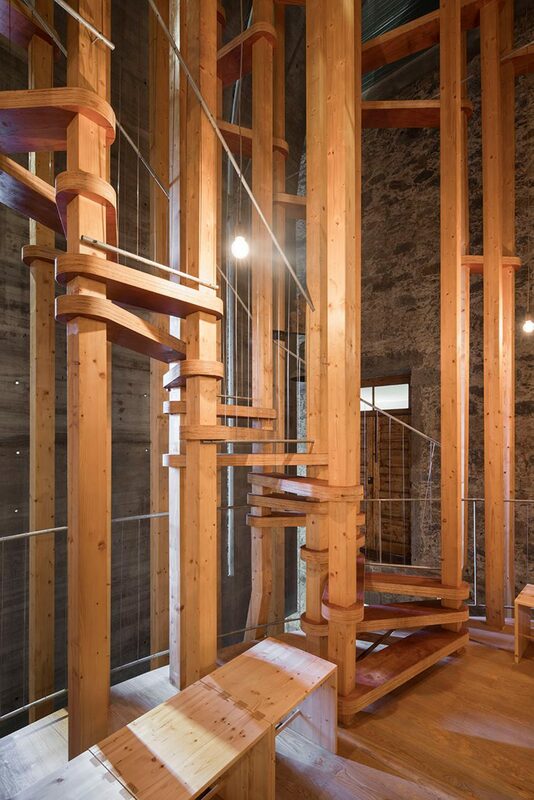 Rather than focusing on the existing building, the architects decided to instead insert a new tree-inspired structure, the Cheia de Graça Chapel, within its walls. Designed to make use of the chapel’s height, this wooden building on stilts creates a sanctuary in the heart of the space. 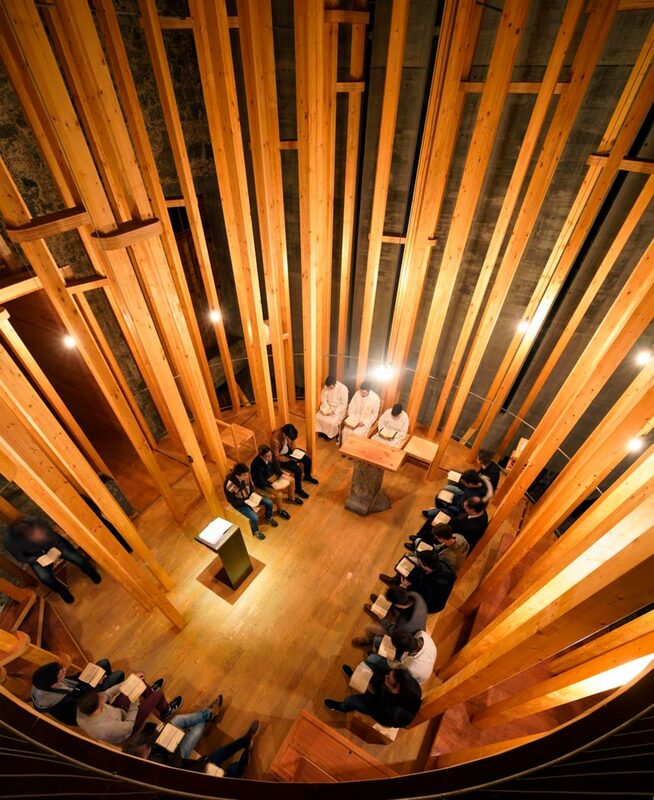 “The chapel erected in wood creates a balanced structure that manifests as a forest at the entrance of the sacred space,” said the design team. The raised canopy contained within the structure is used by members of the church’s seminary as a place to meet or reflect. Meanwhile, the area underneath serves as a divider between the secular and the religious spaces of the chapel. The architects refer to these two elements as the canopy and trunks of the forest. 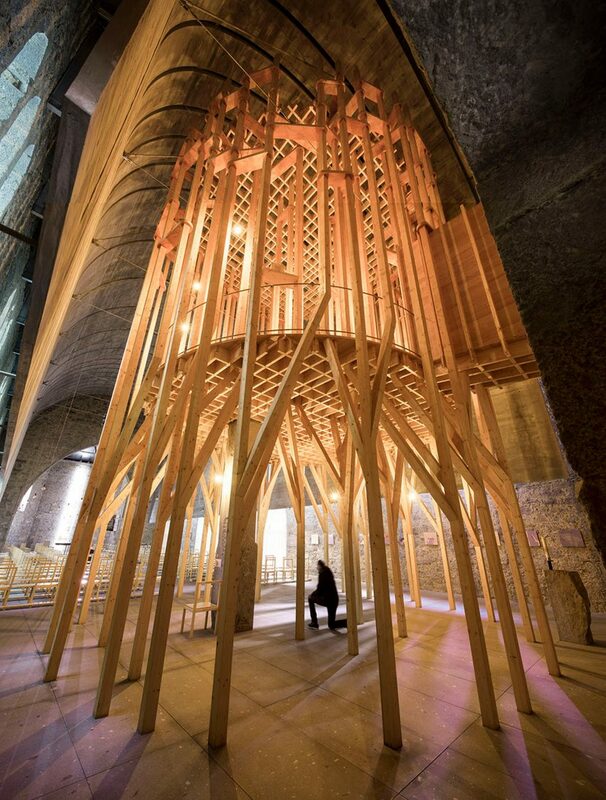 “Its canopy creates a space dedicated to the inhabitants of the seminary and its trunks a filter between the profane space and the sacred space, allowing the visitor to surrender to the space,” they said. A concrete vault is installed around the inside of the building’s roof, framing the new wooden chapel. Set away from the old stone walls, it has a thickness of 12 centimetres and is supported by a slender steel framework. The vault screens the windows. But it is punctured by slender openings that allow shafts of sunlight into the space. “The vault creates a space of absolute ‘restless silence’ for introspection,” added Cerejeira Fontes. The elongated shape of the concrete vault was designed to provide the space with an improved acoustic quality. This is complemented by an acoustic sandwich panel installed within the Cheia de Graça Chapel, helping to reduce echoes. Cerejeira Fontes is led by architects António Jorge Fontes and André Fontes, and sculptor Asbjörn Andresen. 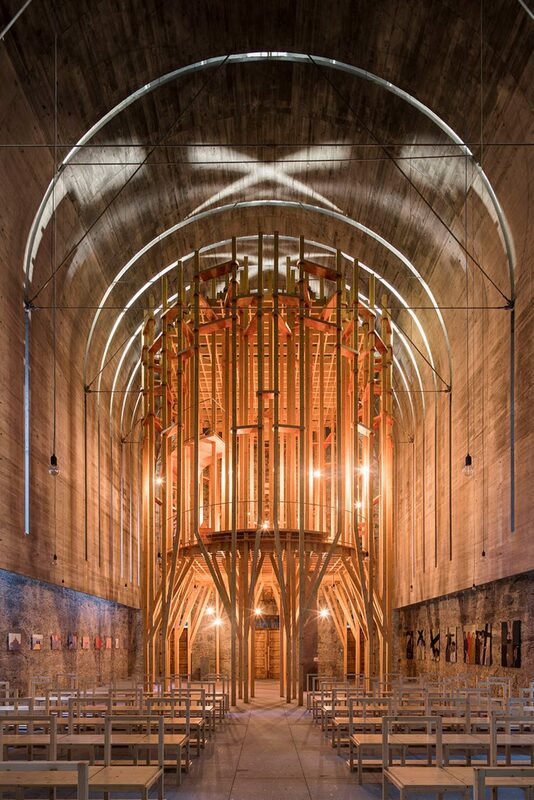 This isn’t the team’s first revamp of a religious building – they previously inserted a slatted timber chapel inside a school for friars elsewhere in Braga. Photography is by Nelson Garrido.